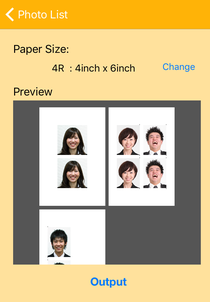 DIY IDPhoto can print out various size IDPhotos in one paper easily using AirPrint printers. If you don’t have an AirPrint printer, DIY IDPhoto can make print out image as Jpeg file and be stored in Camera roll, so you can print it at photo printing store, IDPhoto can also make PDF file and send it by e-mail as attached file to PC which is connecting to printers. This app also can make IDPhoto as image file (JPEG file) and send it by e-mail, so you can submit the IDPhoto electrically. Once you set IDPhoto size and height of the head (Min. & Max.) 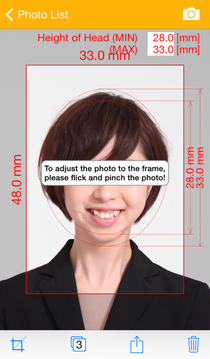 which are required, the guidance lines are displayed on the photo, so you can make the IDPhoto satasfying the requirement rapidly. *Some AirPrint Printers may print the image in larger/smaller size than actual image. In this case, you can correct the error by setting image scale ratio in Settings. 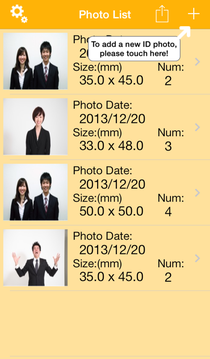 You can make a new ID Photo data by touching the + button on upper-right courner of the Photo List screen. Touch the framing button in the lower-left of the screen. 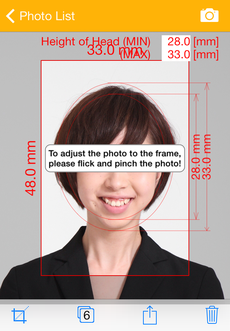 You can change width and height of the IDPhoto, and minimun and maximum of height of head. By touching the Camera button in the upper-right of the screen. You can take a photo by the camera, import from photo album or other IDPhoto data. Adjust the photo by flicking and pinching to match with the guide line and the frame. Set number of photos you need. 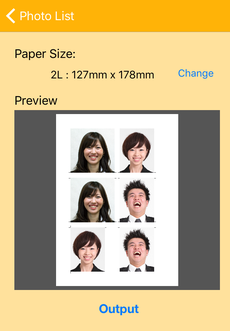 You can print out the IDPhoto or send it by e-mail. Please see section 3. By touching trash button, you can delete this IDPhoto data. Please set number of photos you need and paper size, then the preview image is shown. By touching Output button, you can print out the preview image. If you don’t have AirPrint printer, select “send by e-mail”. You can send the preview image as attached file to printable PCs. If you want to get Jpeg image of the IDPhoto, select “send by e-mail(image only)”. You can set image width in pixel like right screen image. 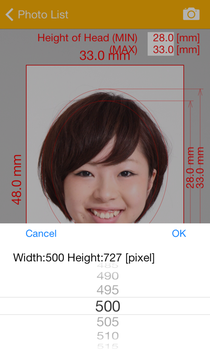 The image height in pixel can be calcurated automatically based on the aspect ratio of the IDPhoto size. Set IDPhoto size even if you need only image file. If the photo is low resolution and/or the zooming too much, you can not get enough image height in pixel you want. Please re-take the photo in that case.